Much has been written about the importance of exercise for senior citizens from reducing the risk of falling to keeping the brain active and possibly preventing disease. I believe staying socially as well as physically active is very important, so each class includes exercises and stretching for every muscle group along with an opportunity to talk about current events, friends, family and 'the good old days'. Work at your own ability level using bands, balls, and hand weights, while also enjoying the social benefits of this class. Perfect exercise class for ALL fitness levels. It's easy to follow and fun! A safe and yet stimulating exercise option for aging adults needing a structured and supportive environment. 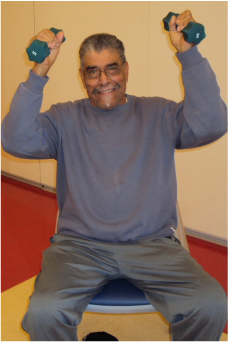 This seated exercise class is sponsored through the Howard County Office on Aging and Independence's 'Connections' Social Day Program.